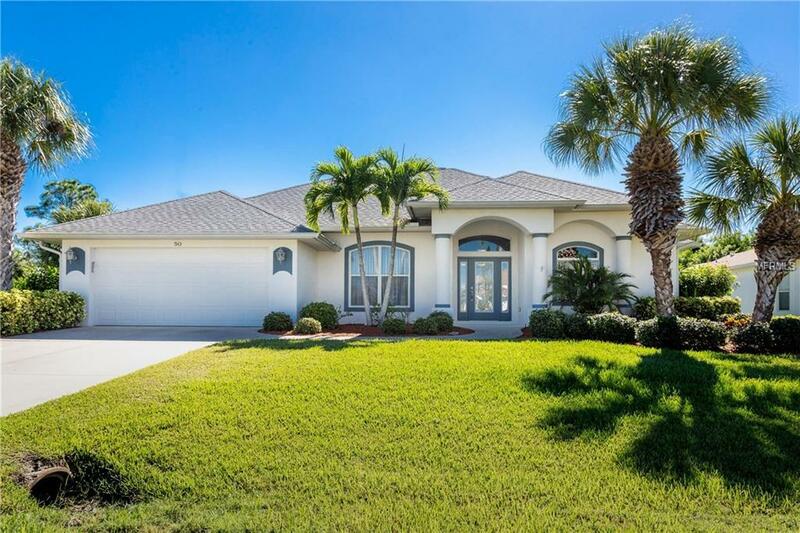 CALLING ALL GOLFERS, this gorgeous ONE OWNER NEWPORT BUILT 3BD/2BA/2CG Golf Course front POOL home is just what you're looking for! Palatial front entrance with etched glass doors welcomes your guests with style.As you enter the tiled foyer, you can appreciate the custom accents galore, cathedral ceilings which add volume and sliding glass doors with a picturesque view of the pool & golf course. Formal Dining room has chair railing and is open to all main living areas which makes it easy to entertain. Kitchen has raised faced cabinetry w/solid surface countertops, pantry, island w/extra storage, breakfast bar & nook. Start your day in the Breakfast Nook which has an attractive pendant light, plant niche & sliding glass doors to Lanai. Huge Master bedroom has tray ceiling, 2' bumpout, pocket sliding glass doors to the lanai, both a wall closet & walk in closet, & a great view of the golf course! The master bathroom has a garden tub, raised height vanity w/double basins, tray ceiling w/crown moulding, & ceiling fan. Guest Bedroom #2 has a walk in closet + ceiling fan, & OVERSIZED Guest Bedroom #3 has a built in desk , 2 closets, & sliding glass doors to the pool area! Guest/pool bath features a shower w/door & raised height vanity w/cultured marble top. The caged pool area offers great GOLF COURSE VIEWS, Kool deck all recently repainted, solar heat to allow you to enjoy the pool all year long, & new screening on the cage. Furniture negotiable separately! You can't beat the view!